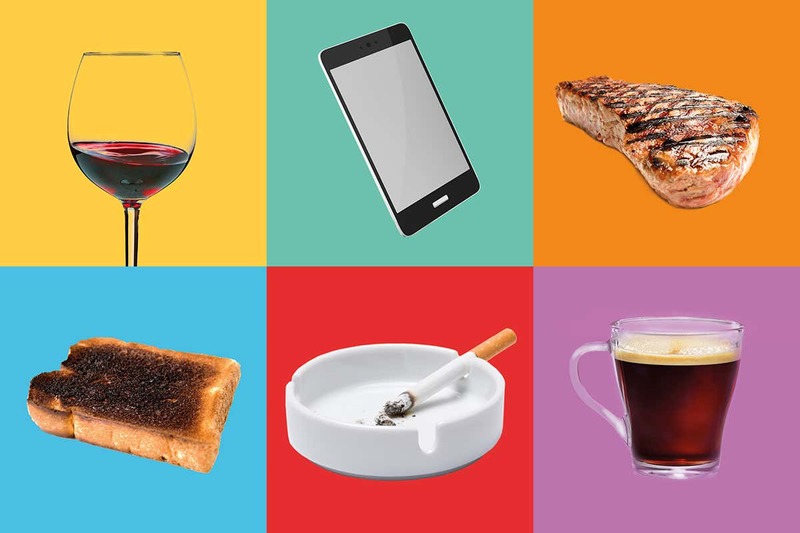 RED meat, cellphones, plastic drinking bottles, artificial sweeteners, power lines, coffee… Which of these have been linked with cancer? If you are unsure, you aren’t alone. The problem isn’t a lack of information. Rather, we are bombarded with so much information and misinformation about what might cause cancer that it is often hard to separate myth from reality. Yet it is something we must all do, because cancer affects every one of us. Whether or not you have had it yourself, you surely know someone who has. For people in the UK, the lifetime chance of being diagnosed with the disease is 1 in 2. Globally, cancer is second only to cardiovascular disease as a cause of death, killing an estimated 1 in 6 people. Cancer is not a single disease and its causes are many and complex, but there are things we can do to reduce our risk – if only we could identify them. That isn’t easy when even the experts don’t always agree. Nevertheless, our knowledge has come a long way in recent years, thanks to a huge amount of research into both environmental factors and genetic susceptibility. So, what do we know – and don’t know – about the causes of cancer? And, when faced with mixed messages, how can we best judge the risks for ourselves? The extent of public confusion on the subject was glaringly exposed in a survey of 1330 people in England published last year. Researchers from University College London and the University of Leeds, UK, reported that more than a third of the general public mistakenly attributed carcinogenic properties to artificial sweeteners, genetically modified food, drinking from plastic bottles and using a cellphone. Over 40 per cent thought stress causes cancer, although there is no proven link. More worryingly, only 60 per cent of people believed sunburn can lead to cancer. And only 30 per cent were aware of the strong link between human papillomavirus (HPV) infection and the disease. Many commentators were surprised by these findings, but they probably shouldn’t have been. When it comes to cancer, the disconnect between people’s beliefs and scientific findings has deep roots. Take, for example, the controversy over aspartame. Over the past half-century, this artificial sweetener has been the subject of intense debate, with public opinion waxing and waning about whether it causes brain cancer. There are plenty of internet articles describing aspartame as a carcinogen. Yet there is no conclusive evidence that it can trigger mutations that cause cells to proliferate out of control, which is the hallmark of cancer. The same goes for antiperspirants, water fluoridation, power lines, smart meters, cleaning products and countless other things. It would be wrong to conclude that we are simply gullible or ignorant. In fact, public opinion isn’t always unfounded. The belief that injuries can cause cancer has been rejected as a myth by cancer experts, including the authors of the UCL/Leeds study, yet research published in 2017 indicates that there may indeed be a link. Besides, there is real uncertainty about the carcinogenic properties of various substances. Take coffee. Last year, a judge in California ruled that all coffee sold in the state should carry a cancer warning because coffee contains acrylamide, which may be carcinogenic. Not long after, California officials rejected the ruling, to the relief of coffee-drinkers everywhere. Yet coffee does contain acrylamide, which the World Health Organization (WHO) describes as a “probable human carcinogen” – despite there being no clear evidence that it increases the risk of any type of cancer in humans. And its presence in fried, roasted and baked foods is the reason we are advised to avoid eating overcooked chips, burnt toast and the like. But whether your morning cup of coffee contains enough to make it a cancer risk isn’t known, as there has been insufficient research to settle the matter. Even where there is a lot of research, results are often open to interpretation. That is partly because both the main approaches to testing potential carcinogens have drawbacks. Laboratory studies using live animals or their cells can be rigorous but the results may not apply to humans. Studies in people, meanwhile, are difficult to interpret because many confounding factors influence the results. This can lead researchers to disagree about the carcinogenic potential of specific behaviours or substances. For example, the general consensus is that there is no direct link between cancer and either vaping or eating red meat, yet studies published in the past couple of years have concluded that there is. Other recent studies have pointed the finger at “bad luck”, a confusing term that might mean that a cancer is associated with factors over which we have no control, or simply that we don’t know the cause. In addition, cancer research isn’t without vested interests – and we are right to be sceptical. After all, the tobacco industry tried to cover up the link between smoking and lung cancer for decades. Then there is the fact that big business does fund academic research, which could create conflicts of interest. Last year, the chief medical officer at one of the world’s leading cancer centres, Memorial Sloan Kettering in New York, resigned amid reports that he had failed to disclose corporate financial ties in papers published in major research journals. Corporate research funding could also undermine the integrity of the findings. A recent paper concluded that randomised clinical trials are more than three times as likely to report positive results when the study has funding from industry. Industry-backed research also tends to be published faster, making it more likely to change policy and practice in cancer care. On the other hand, our suspicion of vested interests can lead to scare stories. For example, in July 2018, The Observer newspaper reported that the cellphone industry had successfully lobbied to cover up a link between phone use and brain cancer, but research has shown there is no such link. In addition, the involvement of big business may influence our assessments of risk. In August, a US court ordered agricultural chemicals giant Monsanto to pay $ 289 million to groundskeeper Dewayne Johnson after ruling that a chemical in its weedkiller was the likely cause of his cancer, even though there is limited scientific evidence to support that judgement. A judge has since reduced the payout, and Johnson has agreed to accept $ 78 million. The biggest risk factor is tobacco, which accounts for 22 per cent of cancer-related deaths worldwide. The WHO also singles out exposure to sunlight and other forms of radiation, and notes that cancer-causing infections such as hepatitis and HPV are responsible for up to a quarter of cancer cases in low and middle-income countries. Admittedly, researchers have homed in on a whole range of carcinogens (see “Risky and not so risky”) and it isn’t always possible to avoid or reduce our exposure to them. But a bigger problem is that we still have a long way to go to identify all the risk factors for cancer. Recent research found that only about four out of 10 cases are due to a known cause, with smoking and obesity accounting for the majority of these. Another study put the level of uncertainty even higher. It concluded that two-thirds of all cancers are consequences of “random mutations” – DNA copying errors that cannot be predicted at present. With so much effort and money being poured into cancer research, why are we still so ignorant? Well, cancer isn’t like most other diseases. For a start, it can develop slowly, making it almost impossible to pinpoint the cause as you can with, say, malaria or cholera. There also isn’t a simple link between cause and effect – a person may chain-smoke all their life, for example, and never get lung cancer. In fact, in most cases it is simplistic to think there is a single cause: the uncontrolled division of cells that characterises cancer can be triggered by a multitude of environmental factors interacting in complex ways. What is more, we still have much to learn about the genetic basis of cancer. True, biologists have made enormous strides in determining the exact mutations involved. We know, for example, that fusion genes – those made up of two genes originally on separate chromosomes – are frequently present in some blood and skin cancers. We also know that a gene called TP53 is crucial for suppressing tumour development, and that it is the most frequently mutated gene in human cancers. Yet its range of functions remains notoriously enigmatic. Indeed, we still don’t know the exact number of genes in the human genome, let alone the relationships between them or what other changes are needed for cancer to arise. Another equally complicated area of emerging interest is the microbiome: the microbes that live on and inside the body. Each of us has hundreds of species of bacteria coexisting in our gut, and a deficiency of some or the presence of others may predispose people to cancer. Helicobacter pylori, for example, is an accepted causal factor in gastric cancer. Diet, hygiene and the environment all interact to influence our microbiome. As yet, we know very little about the interplay between these factors, and between the genome and the microbiome, or exactly how these bacteria promote or reduce cancer risk. All this makes working out what causes cancer a daunting task. However, there is a way of thinking about the problem that might help. Cancer has been a fact of life, and death, throughout human evolution. As a result, we aren’t totally at its mercy because our immune system has evolved mechanisms to block the disease. One is the aforementioned TP53 which, among other things, encodes a protein that stops cancer cells proliferating. Another, known as cell cycle arrest, prevents aberrant cells from completing their normal life cycle. Paul Ewald and Holly Swain Ewald at the University of Louisville, Kentucky, refer to such mechanisms as “barriers”. If in doubt about whether something is linked with cancer, they argue, we should consider whether it has the potential to weaken these barriers. “An evolutionary perspective allows you to make reasonable, albeit tentative, conclusions in the absence of concrete evidence,” says Paul Ewald. Such thinking could help explain why cancer is so common in the modern world. One reason is that people are living longer, increasing the chances that DNA copying errors will lead to cancer. But another may be that we aren’t behaving as we evolved to behave. An illustration of this so-called evolutionary mismatch is a shift away from breastfeeding, depriving infants of complex sugars that help nourish the gut bacteria that fine-tune their immune system. More generally, as living standards rise, children are less likely to be exposed to pathogens that prime their immune systems to fight disease later in life. Research by Mel Greaves at the Institute for Cancer Research in London suggests that a common childhood cancer, acute lymphoblastic leukaemia, may arise in this way. By adopting modern lifestyles, then, we could inadvertently be breaking down the barriers that block cancer. If so, taking an evolutionary perspective could help researchers home in on risk factors – and guide the rest of us in judging which behaviours and substances to try to avoid. But the problem remains complex. Paul Ewald cautions that we need to look at the interplay among factors rather than simple causal chains. And Greaves notes that Western lifestyles have altered so much and so fast – a process that is ongoing – that pinpointing the changes involved in cancer won’t be simple. The good news is that we may already have the information we need. Every year, large, costly studies are launched to try to determine whether a certain substance or behaviour is carcinogenic. It is hard to sift through the mountain of data without some idea of what to look for. But evolutionary thinking can help us shine our searchlight in the right direction. It may never be possible to identify all the interconnected factors behind a particular individual’s cancer, but we can still make informed judgements about risk. Faced with the next media scare story, ask yourself whether the claim is supported by data, whether vested interests are involved and, most importantly, whether it makes sense in light of how humans evolved to live.